Swimming the English Channel is regarded as the pinnacle for most long distance swimmers due to the cold water, challenging tides and the fact the waterway is the busiest in the world. 1. 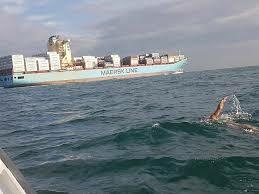 What is the shortest distance a successful swimmer will need to cover from England to France? 2. Who was the first person to successfully swim the English Channel on August 25, 1875? 3. How many years elapsed between the first and second successful swims of the English Channel? 4. Gertrude Erdele, the first woman to complete a Channel swim hailed from what country? 5. As of July 2018, what is the fastest Channel swim time? 6. What English comedian swam the Channel in 2006 as part of a Sport Relief fund-raiser? 7. As of July, 2018 what is the record for the most successful English Channel swims? 8. Between 1926 and 2017 how many recorded deaths have occurred during English Channel attempts? 9. As of July, 2018 what is the slowest successful Channel swim? 10. As of 2018, approximately how many successful Channel swims have been made?